At this point in the SQ8's development, Audi's engineers at the Nürburgring don't even bother trying to hide the performance SUV's look. This video provides a fantastic opportunity of seeing the model on the move around the Nordschleife. Compared to the standard Q8, the S version gains more open lower intakes and a more prominent front splitter. The ride height is also lower. The lack of wheel travel might reduce off-road capability, but most folks aren't taking these machines onto rugged terrain. At the rear, quad exhaust outlets replace the usual trapezoidal tips. Earlier images indicate that Audi intends to offer the SQ8 with diesel- and gasoline-fueled powerplants. Markets that prefer their performance to come from petrol, like the United States, would get a 470-horsepower (351-kilowatt) 3.0-liter V6 with hybrid assistance. Europeans would get the machine with the 429-hp (320-kW) 4.0-liter V8 from the SQ7 and the Bentley Bentayga diesel. The latest speculation indicates Audi intends to unveil the SQ8 officially in the fall, possibly at October's Paris Motor Show. Sales in Europe could begin as soon as December. 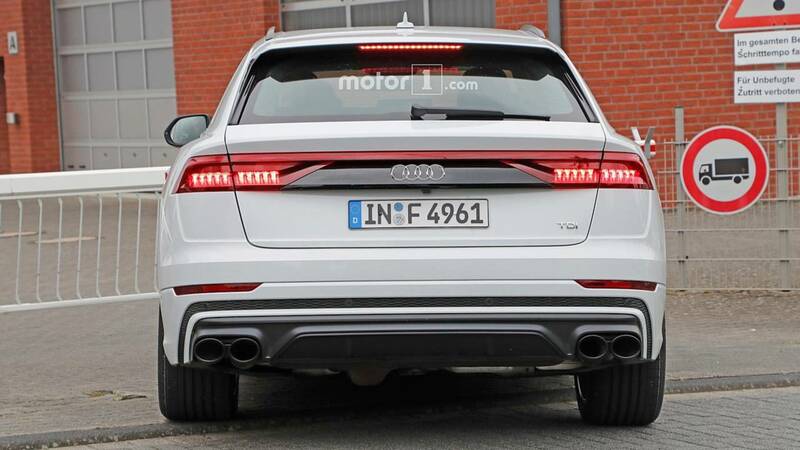 Customers looking for even more power should be patient for the even more potent RS Q8. It would reportedly get the hybrid, biturbo 4.0-liter V8 from the Porsche Panamera Turbo S E-Hybrid that produces 680 hp (507 kW) and 626 pound-feet (849 Newton-meters) of torque. The standard Q8 goes on sale in Europe in August, and Americans need to wait until the the fourth quarter of 2018 to get one. The stylish SUV is available with a 282-hp (210-kW) mild hybrid V6 diesel or a 340-hp (253-kW) 3.0 TFSI gasoline powerplant. A less powerful diesel also comes later.